What’re you gonna do when Spock’s on hiatus? If you’re Zachary Quinto—who plays the younger version of the most famous Vulcan ever in the J. J. Abrams-helmed Star Trek film franchise—you break character by playing an emotionally charged, successful, first-generation Greek-American businessman who impulsively smacks a misbehaving, spoiled-brat momma’s boy in the opening chapter of the eight-episode NBC drama, The Slap, which premiered last night. Hector’s parents (Brian Cox as Manolis and Maria Tucci as Koula) are Old World Greeks who bicker in their native tongue about how best to meddle in their children’s and grandchildren’s lives. A nearly unrecognizable Uma Thurman shows up as a family friend with a much younger love interest in tow, and thus far adds nothing to the program’s overall dynamic. The remainder of the adult cast is rounded out by Thandie Newton as Hector’s beleaguered wife, Aisha, and Makenzie Leigh as Connie, Aisha’s young coworker who is, like, totally crushing on a not entirely unreceptive Hector. And the children! Good Lord, the depiction of children in this program’s debut episode could serve as a public service announcement for Zero Population Growth. Harry and Aisha’s son and daughter are at odds constantly, which drives Harry to booze, cigarettes, vinyl jazz consumed through headphones from a vintage stereo, and the undeniable charms of sweet, sweet, full-lipped and adulterous-minded Connie. Gary and Rosie’s son, Hugo, is a hot mess; whether he’s decimating a flower-bed, ruining Harry’s jazz LPs (for this writer, perhaps the most horrifying act ever depicted onscreen), or, constituting the straw that prompts the violent act of the show’s title, violently swinging a baseball bat at other children. The show tells the story from the differing perspectives of its major characters, and it emphasizes how Harry’s slapping of Hugo resonates differently among them. The premiere focuses on Hector, who is passed over for a promotion in favor of a woman the day before his landmark birthday. Since it’s his birthday and all, I suppose it makes sense that Hector’s perspective—children are annoying and exist only to destroy one’s solitude and property, parents are busybodies, the wife is a soul-crushing harpy with a bony knee always figuratively in close proximity to Hector’s groin, and young hotties are drawn to his charms and complexities no one else seems to recognize—is a bit over-the-top in its solipsism. It will truly be interesting to see how the perspectives of the other characters play out, Rashomon-style, in the show’s depiction of how events post-slap shape and reshape the story and the truths, half-truths, and downright lies within. 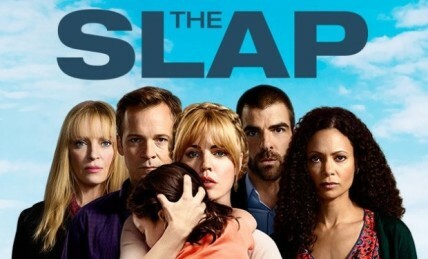 The Slap is adapted from an Australian program I haven’t watched, but have been told by one whose opinion I trust and admire that it was “rather interesting,” which will more than likely prompt my seeking it out on Netflix. Drama told from different perspectives certainly has rich literary and cinematic antecedents, including the Akira Kuroswawa film mentioned above and Robertson Davies’ Deptford Trilogy of novels. The challenge for The Slap is to keep the audience engaged while watching characters that, thus far, haven’t exuded the slightest amount of likeability, regardless of whose perspective they’re seen from. I’m willing, for the present, to place that carp at the feet of Hector, a profoundly unhappy individual, and hope the next episodes feature a less cynical, middle-aged, world-weary point of view. If nothing else, let’s hope that they do it for the show’s children.